“Texas is better when your economy is strong.” That is the message Governor Greg Abbott shared with local leaders and business members of the Rockport-Fulton Chamber in this video supporting economic development efforts in the Coastal Bend communities impacted by Hurricane Harvey. Governor Abbott again extended the State Disaster Proclamation for Texas counties impacted by Hurricane Harvey. Governor Abbott appointed former State Representative Gene Seaman of Corpus Christi, owner of Seaman Financial and a real estate developer in the Coastal Bend area, to the OneStar National Service Commission, which serves as the state's liaison to the Corporation for National and Community Service. In addition to other responsibilities, the Commission helps to oversee the Rebuild Texas Fund to help Texans recovering from Hurricane Harvey. 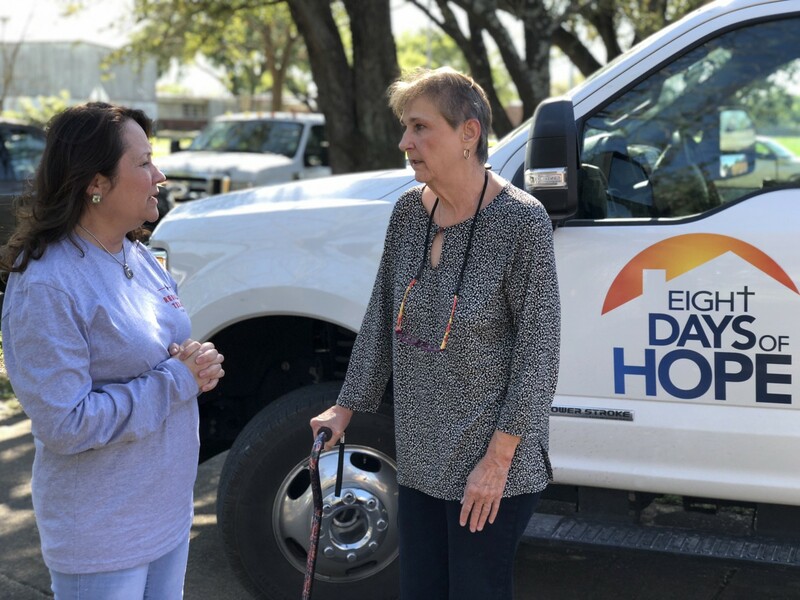 First Lady Cecilia Abbott visited a home in Southeast Houston where she joined volunteers from the Rebuild Texas Fund, Michael and Susan Dell Foundation, 4B Disaster Response Network and Eight Days of Hope helping to rebuild a home damaged by Hurricane Harvey. During her visit, the First Lady met with volunteers and assisted in the repair efforts. The First Lady then stopped by Grace Community Church, which is serving dinner each evening to the more than four thousand volunteers assisting in the rebuilding efforts. As of March 29, 2018, more than 6,183 reports have been submitted from the field to the Commission’s Assistance Center. From those, the Assistance Center identified 726 issues needing follow-up or resolution and all but two have been resolved. Current individual assistance numbers are now posted on rebuildtexas.today/recovery-tracker. Transitional Sheltering Assistance (TSA) eligibility ends today, April 2, for some survivors. TSA participants will receive a phone call, email and/or text message advising them if they have continued eligibility for assistance through a participating hotel. FEMA granted Governor Abbott’s request to extend the deadline for TSA for some victims of Hurricane Harvey to April 23, 2018, with an eligibility review on April 2, 2018. Disaster victims with questions regarding their TSA program eligibility or status may contact the FEMA Helpline at 800-621-3362 for assistance. FEMA’s Disaster Distress Helpline offers trained professionals who can help callers cope with anxiety or stress, and guide them to available resources. This toll-free, multilingual and confidential crisis support service is open 24 hours a day, seven days a week. Call 800-985-5990, 800-846-8517 (TTY) or text TalkWithUs (Spanish-speakers text: Hablanos) to 66746. Governor Abbott and Texas Land Commissioner George P. Bush announced more than 10,000 homes have received repairs through the Partial Repair and Essential Power for Sheltering (PREPS) Program in coordination with FEMA. Designed to help homeowners with less than $17,000 in FEMA-verified loss resulting from Hurricane Harvey, PREPS provides basic repairs including restoring electricity, air conditioning/heating and hot water as well as debris removal, limited drywall and insulation, and restoring a functional bathroom and kitchen facilities to return the homes to a safe, sanitary and secure standard. Governor Abbott and Commissioner Bush announced Phil Wilson is joining the Hurricane recovery effort to assist with the final push to complete the short-term housing recovery programs. Wilson will lend his expertise on an interim assignment, helping to eliminate any remaining roadblocks on the path to housing the remaining Hurricane Harvey survivors eligible for FEMA direct housing assistance. Current housing numbers are now posted on rebuildtexas.today/recovery-tracker. TexasRebuilds.com is the housing information resource for individuals and communities. Follow Twitter.com/TXGLO for pictures of move-in days and updates on housing recovery. The Texas Department of Insurance’s Help After Harvey page explains consumer options to challenge an insurer’s estimate of damages or a claims denial. TDI can help with insurance questions and complaints through the Consumer Help Line at 800-252-3439, 8 a.m. to 5 p.m., Mon. to Fri. Flood insurance must be maintained to qualify for federal assistance in the future. NFIP policyholders with questions may call 800-621-3362, Mon. to Sat., 7 a.m. to 7 p.m. For information, visit www.FloodSmart.gov. The Federal Housing Administration offers mortgage relief options to Hurricane Harvey survivors in Texas at 800-CALL-FHA. Cadets from the U.S. Air Force Academy and from The Virginia Military Institute (VMI) joined forces with Samaritan’s Purse over Spring Break, helping to rebuild and repair homes for residents in Aransas County.